Today we took one more step toward running the entire Outside Supply office in New Orleans, Louisiana on our own alternative energy products. Right now, we are using the solar power to run one of two desktop computers with the monitor. With the battery (charged by the solar power) serving as a backup incase the sun goes behind the clouds, the computer is running really great on the solar energy. Then again, it is New Orleans, so there is hardly any escape from the sun anyway. We took two 95 Watt Solar Panel Kits, and put them on the roof of the garage/office. 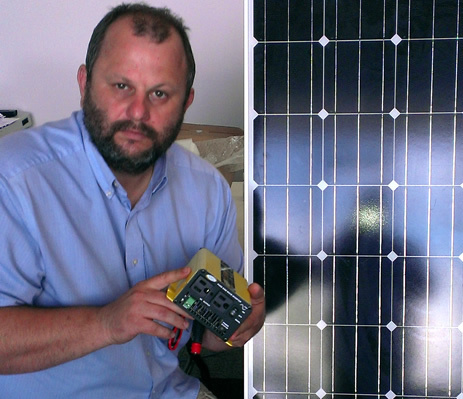 The solar panels are hooked to a battery, which is hooked to a 300 Watt True Sine Wave Power Inverter. The Solar Panel kits come with everything you need to install solar panels, including wires, brackets and the charge controllers used to measure the amperage the sun is providing. Installation was easy, and only took about an hour to do. We just let the battery we installed charge for about a day before we plugged the computer in. The best way to reap the benefits of solar powered appliances is to cut back on energy usage first. The less solar panels you have to buy, the better. Look below for a picture. 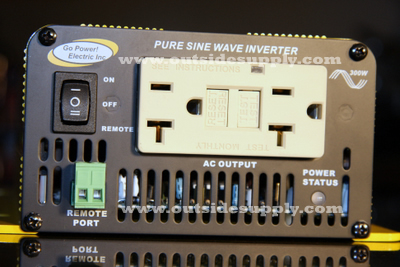 Here is a 95 watt solar panel and power inverter. Here's the Power Inverter we plugged the computer and the monitor into.